Since you already know it’s coming, it is crucial to plan ahead to prevent the slump from happening. If you’ve been working in the fitness or wellness industry for a while, then you probably already know that the beginning of the New Year is your industry’s peak season. Motivation is at its highest during that time of year, but the main concern is keeping that motivation alive. The beginning of a new year is a great opportunity to transform new and potential clients into recurring ones, and the key to that is to appeal to your clients’ sense of ambition. One way of doing so is to just talk to them. This will not only help you learn more about your potential clients and their respective goals, but will also help shape your clients’ objectives. But, once your clients go back home, it is easy for them to wake up the next morning feeling discouraged. That’s when the Internet comes in and works its magic 🔅 With the use of an online booking platform, you can customize the communications sent to your clients, so that you can add a personalized message encouraging them to keep up the good work. You can even generate a list of your clients that haven’t shown up in a while, and follow up by email or phone. That way, you can give them the boost they need, and get them right back on track. 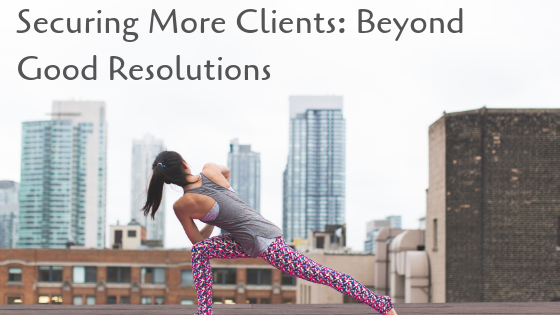 One thing we can’t forget is that clients aren’t the only ones setting resolutions for the new year. Most businesses also set different resolutions they aspire to uphold in 2019. This means that your competitors are most probably bringing something brand new to the table, or offering great deals, appealing to your potential clients (whose resolution could be to save money). How can you compete with that and stay on top? Simple, offer better options than them! If you’re a fitness or yoga instructor and offer classes, make sure to diversify the nature of your classes. Come up with innovative and interesting themes for them, and invite your current but also potential clients to book a class with you! In the same line of thought, you can create great “Start of the year” deals in the form of token cards, which again, can motivate potential clients to purchase and use those token cards throughout the year. At the end of the day, although the downside of New Year’s resolutions is mostly portrayed in a negative light, it is an opportunity for you to take risks and perhaps even gain from them. It is the perfect time for your business to test its own resolutions for the year, and adjust them to secure more clients in the long-run. One way to do so is by getting relevant feedback from your current and potential clients, through online reviews and ratings, on how you can continuously improve your services for them to consider becoming long-term recurring clients. This can be a great way to reach out to clients that haven’t been coming in and show them that you care about their opinion, which eventually, can even make them reconsider their own decisions. Everyone is ambitious and positively motivated when the New Year comes around. It’s an opportunity to start fresh and finally follow through on all those activities you’ve wanted to uptake for a while now. But, we’re only human, and it’s easier to get discouraged than encouraged. That’s when you come in the equation! You can switch things around for both you and your clients, by spreading positive energy both internally, in your workplace, and externally, through the magic of the web.